At the start of 1919, much of the world was still recovering from World War I which had ended nearly fourteen months earlier. The January issue of Junior Soldiers of the Soil (predecessor to National 4-H News) had a number of articles about hunger in the aftermath of war. One member wrote, “We are glad that the war is over but I am not going to stop raising food. It is just as patriotic to raise food now as ever, so let all Junior Soldiers raise more food and make ourselves known as loyal Junior Soldiers.” Later in the issue is a call to “Organize a Junior Soldier Squad.” President Hoover cautioned that, “We must export ten times as much food if we prevent Europe from starving during the coming year. Let every one of us raise food and feed” to help save Europe. Since that time, programs have been created to help combat hunger in the US and countries around the world. Yet, USDA reports that in 2014 an estimated 14.0 percent of American households (over one in seven) were food insecure at least some time during the year and the prevalence of very low food security was at 5.6 percent. 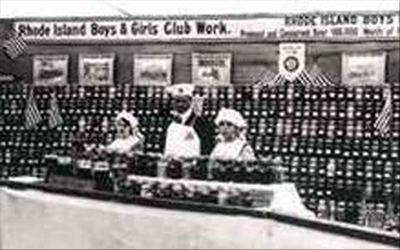 Rhode Island Club girls show their patriotism with this 1918 exhibit of canned produce they have grown and preserved. Notice the flags among the canned goods. This entry was posted in History and tagged 4-H History, Junior Soldiers of the Soil by Jim Kahler. Bookmark the permalink.